My work explores psychological and socio-political themes surrounding liminal identity, cultural assimilation, and the Filipino/a diaspora, tempered by my experience as a Filipina immigrant living in the United States. In my current work, I navigate through the colonial history of the pineapple in the Philippines, the native’s appropriation of piña fiber, and its relationship with the idea of “Maria Clara” (a mestiza character from Jose Rizal’s novel, Noli me Tangere). Originally, Spain introduced the pineapple to the Philippines (from another colony). Piña fiber—extracted from leaves and woven with organza—became an ingredient in traditional, upper-class Filipina women’s clothing known colloquially as “Maria Clara.” The “Maria Clara” evolved into a symbol of Philippine ideals of beauty and status, accompanied by stereotypes of chastity, demureness, light skin, and passivity. Today, popular Philippine concepts regarding beauty and status center on the normalization of skin-whitening products and championing of imported goods. My work presents and challenges the displacement and inferiorization of native ideals by the colonizer, signified by clothing made from a foreign fruit. 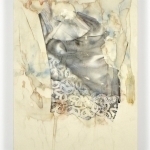 Through the process of repetitive layering and a palette evoking skin tones, I utilize the tactility of specific materials such as image transfers on synthetic organza and piña fiber to extract and repudiate these imposed ideals and stereotypes—material remnants intertwined with cultural legacies. Intertwined, 2016. 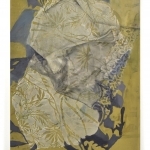 Image transfer & silkscreen on paper and synthetic organza mounted on panel, 20″ x 24″. 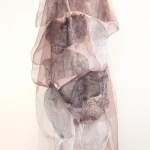 Rea Lynn de Guzman is an interdisciplinary artist working in painting, print media, and sculpture. Originally from Manila, Philippines, she immigrated to the United States as a teenager. She received her MFA from the School of the Art Institute of Chicago and her BFA from the San Francisco Art Institute. 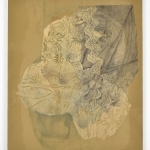 She has exhibited her work in the Bay Area, Chicago, Washington D.C., Hawaii, and internationally in India. 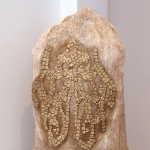 Her sculpture After Maria Clara’s Piña Fiber Sleeve was featured at ARTslant, where it was awarded ARTslant’s Mixed Media Showcase Juried Winner in 2014. She is also Kearny Street Workshop’s APAture Visual Arts Featured Artist in 2017. She teaches art at the City College of San Francisco Fort Mason Campus, San Francisco Center for the Book and Root Division, where she served as the organization’s first Filipina Teaching Fellow in 2017. She lives and works in San Francisco.